Bathenjan Maqli Bel-Basal is a specialty of Hama, Syria. 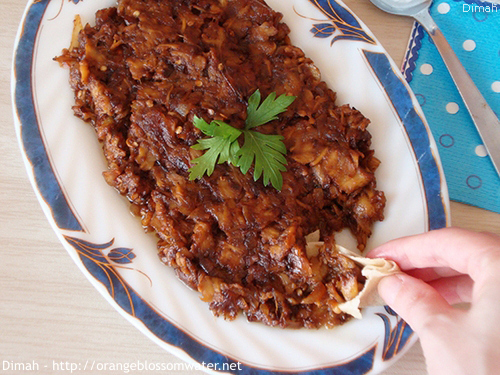 It is prepared by deep frying eggplants, then mix them with caramelized onions. 1. Bring large eggplants, and wash them. 2. Cut off the cap and the stem of the eggplants. 3, 4. Use peeler, and peel the eggplants. 5,6, 7. 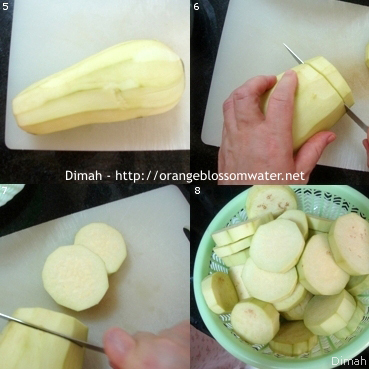 Cut peeled eggplants into round slices with about 0.5 inch (1.3 cm) thickness. 8. Put eggplants in a colander. 9, 10. Rinse eggplants with water, then season with salt. 11, 12,13, 14. Deep fry eggplants until brown in color, then drain on paper towel with changing the paper towel several times to get rid of excess oil, and set aside. 15, 16. Bring onions, and clean the onion of the dry skin and the root and stem tips. 17, 18, 19, 20. Cut the onion in half, top to bottom. 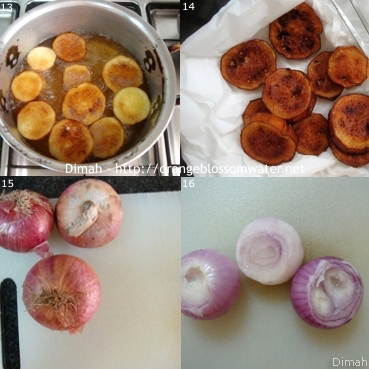 Then slice the onion, flat side down, to make strips of onion, there is no need to separate the layers. 21. Put olive oil in a deep pot. 22. Turn on heat, add the onions all at once to olive oil. 23, 24. 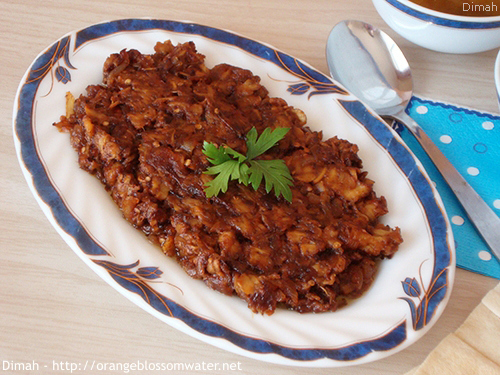 On low heat with stirring, caramelize the onions into golden brown in color (don’t turn them to crispy onions). 25, 26. Add fried eggplants to caramelized onions. 27, 28. 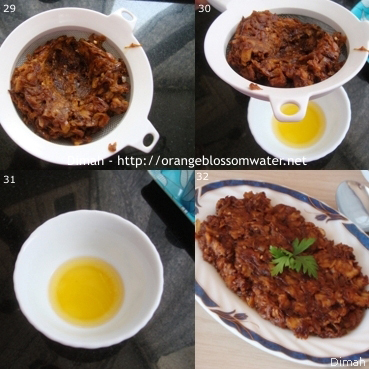 Use a spoon, stir eggplants with caramelized onions, and mash the eggplants using the back of the spoon, taste and season with salt if needed, keep on stirring and mashing for about 10 minutes, then turn off heat. 29, 30. 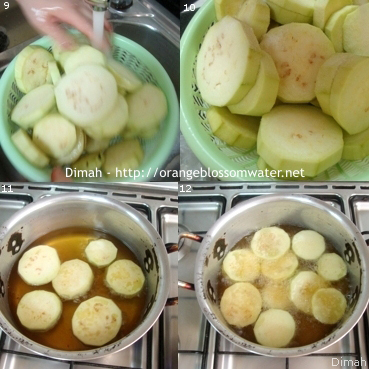 Put strainer over a bowl, and strain the mixture of mashed eggplants and carmalized onions, to get rid of excess oil. 32. Transfer the mixture into a serving plate. 33. 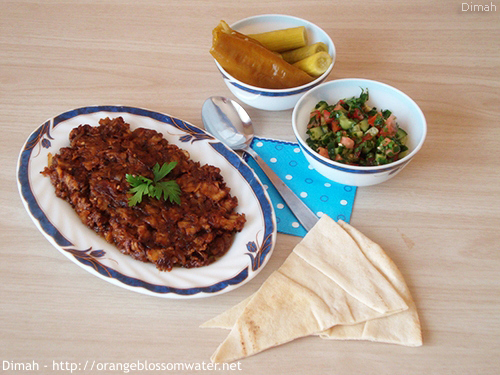 Serve Bathenjan Maqli Bel-Basal hot or cold with Arabic flat bread, and salad (salad is prepared from tomato, cucumber, flat parsley, mint, onion, lemon juice, olive oil and salt), and with long green pepper pickles and Armenian cucumber pickles (I’ll post recipe of pickles very soon). Bring large eggplants, and wash them. Cut off the cap and the stem of the eggplants. Use peeler, and peel the eggplants. 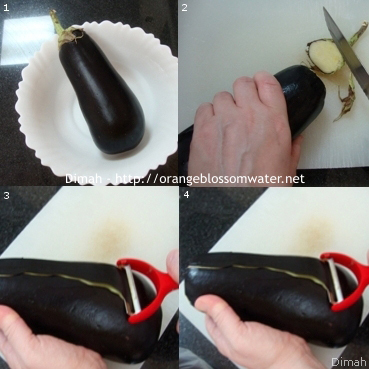 Cut peeled eggplants into round slices with about 0.5 inch (1.3 cm) thickness. Put eggplants in a colander. Rinse eggplants with water, then season with salt. Deep fry eggplants until brown in color, then drain on paper towel with changing the paper towel several times to get rid of excess oil, and set aside. 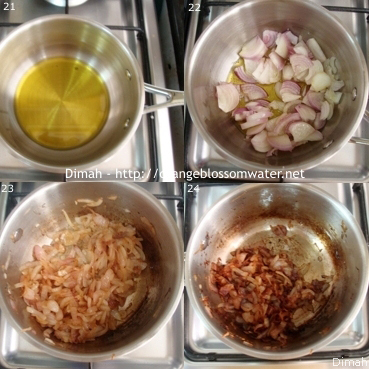 Bring onions, and clean the onion of the dry skin and the root and stem tips. Cut the onion in half, top to bottom. 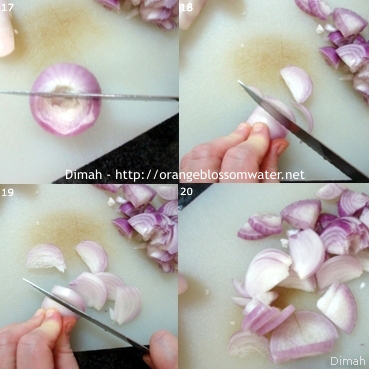 Then slice the onion, flat side down, to make strips of onion, there is no need to separate the layers. Put olive oil in a deep pot. Turn on heat, add the onions all at once to olive oil. 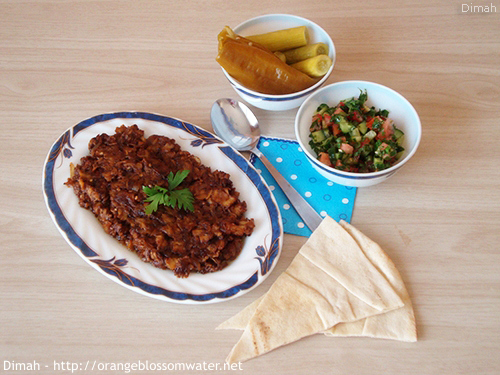 On low heat with stirring, caramelize the onions into golden brown in color (don’t turn them to crispy onions). Add fried eggplants to caramelized onions. 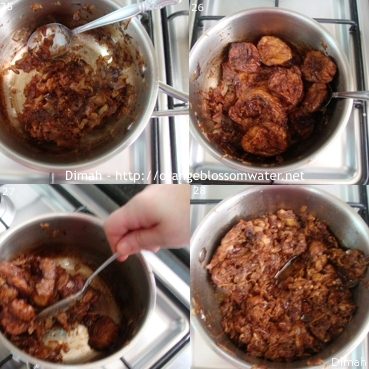 Use a spoon, stir eggplants with caramelized onions, and mash the eggplants using the back of the spoon, taste and season with salt if needed, keep on stirring and mashing for about 10 minutes, then turn off heat. 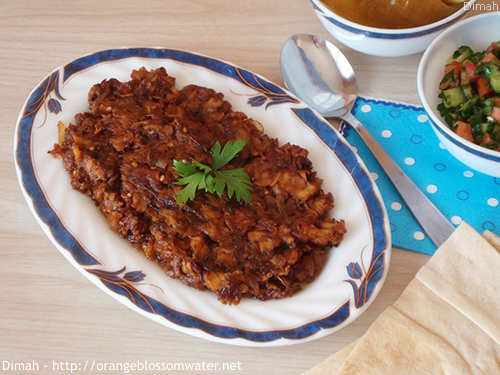 Put strainer over a bowl, and strain the mixture of mashed eggplants and caramelized onions, to get rid of excess oil. Transfer the mixture into a serving plate. 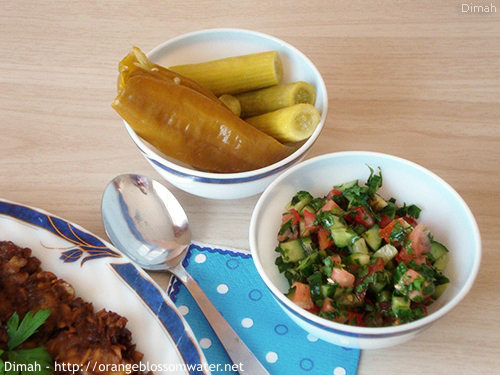 Serve Bathenjan Maqli Bel-Basal hot or cold with Arabic flat bread, and salad (salad is prepared from tomato, cucumber, flat parsley, mint, onion, lemon juice, olive oil and salt), and with long green pepper pickles and Armenian cucumber pickles (I’ll post recipe of pickles very soon). 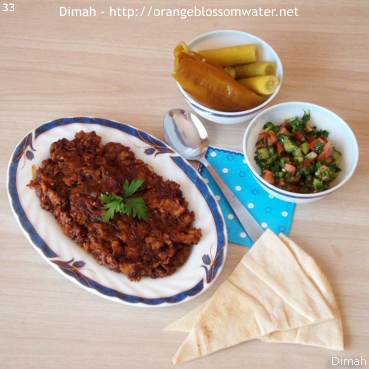 This entry was posted on Tuesday, June 18th, 2013 at 12:48 AM	and is filed under Syrian Cooking. You can follow any responses to this entry through the RSS 2.0 feed. You can skip to the end and leave a response. Pinging is currently not allowed.